⟩⟩⟩ 5. 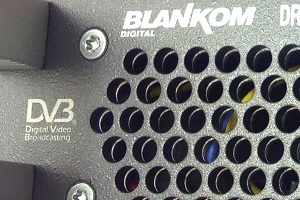 Generation BLANKOM® IPTV Headend Technology. Broadcast grade, high performance transcoder for up to 32 SD or 16 HD or 1 4K UHD channels. BTR-6000 can process SD/HD efficiently based on the high-performance processing chip, is designed specifically for IPTV system with HEVC/H.265 low bit rate compression. The programs can be converted to a low bit rate (<600kbps,D1) while maintaining image quality. It also supports IP remultiplexing MPTS and SPTS streams. The Video multiple resolution functions can be used for multi-screen (TVs, Smart phones, tablets, PCs, etc) perfectly. The friendly network management tools can help to setup and monitor working status easily. Up to 32 channel SD, or 16 channels HD, or 1 channel 4K UHD Multiscreen Transcoder with Multiplexer. BLANKOM BTR-6000 is a Transcoder and Muliplexer in one unit. It is a professional 4K UHD, HD, SD audio & video transcoding and multiplexing device. It has IP input for various data formats in SPTS an MPTS and USB 3.0 video input for local media insertion. BTR-6000 supports H.265/HEVC, MPEG-4 AVC/H.264, MPEG-2 video and MPEG 1 Layer 2, MPEG-2 AAC, MPEG-4 AAC audio encoding at the input. This device can simultaneously transcode up to 32x SD, 16x 720p HD, 8x 1080p HD, 1x 4K UHD streams. 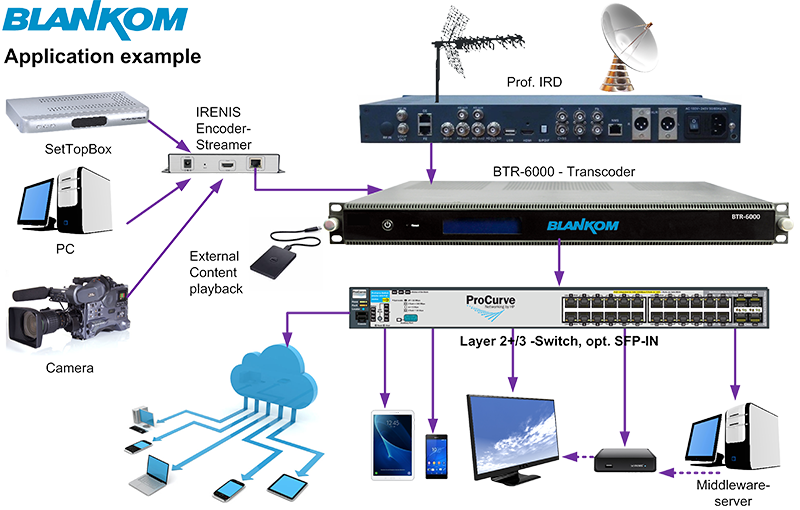 The device can remultiplex up to 200 input ts streams into 200 output ts streams (MPTS, SPTS, transcoding off). Transcoder for IPTV and OTT headends. Transcoder and local media inserter for broadcasting purposes.